That's it - no more information than that to clarify details to the summoned juror. The word REPORT is set in threatening all caps. I once got a summons and spent much time just waiting in the Jury Assembly Room. I spent that time reviewing the summons and the accompanying letter, determining what I wish I had been told in the letter, and redesigning the letter to contain more information, be more user-friendly, provide more details about the jury duty experience, educate me about the jury process, and welcome me to the courthouse and the procedure with more inviting information. I spent that evening designing and printing a draft of a new pamphlet to send with the summons instead of the form letter. The next day in the Assembly Room, I discussed the existing pieces with those around me and showed them the draft I had created. There was unanimous agreement about the cold nature of the existing pieces, the need for a better piece, and approval of the new draft. Above: The cover of the new pamphlet and the opening spread. Below: The inside spread. 1. Some county residents groan at being selected for jury duty. This pamphlet is positive and upbeat with a brief introduction to the jury system emphasizing its importance in our society. 2. 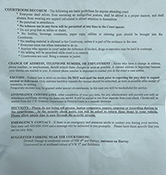 It shows the County Court Clerk's office cares about prospective jurors. It respects the time and contribution of county residents by informing them of basic juror information in an easy-to-read format. 3. 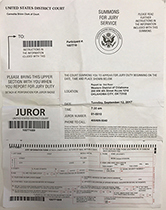 Its a handy size that fits in the same envelope as the Jury Summons (there should also be some available in the Jury Assembly Room). 4. The map includes exits off the nearby interstate highways, locations of parking garages, and nearby sights. 5. The streets and intersections are more clearly delineated. 6. There is a brief explanation of the jury and trial history and process. 7. It combines multiple pages of previous forms into one page. 8. It could be easily and inexpensively produced in the County Print Shop. Lesson: Great design must be for the user, not for the client, and certainly not for the designer. Hats off to Jim Watson, Professor of Design at the University of Central Oklahoma. He was called to jury duty at the county level. And although that's a civic duty many have had the displeasure of taking on, Jim made the most of it. He was so frustrated with the disorganization of the process, he came back and put together a brochure for prospective jurors - a nifty map to the county building, where to eat while you're there, parking, the pay, what to see and do during the lunch hour, what you should take along, some basic information - all in a nice package. The brochure also begins with a positive slant to serving, giving the history of the jury system. The brochure tells why it's neat to be a part of the process, to overcome the negative attitude. He took it with him when he went down to serve. 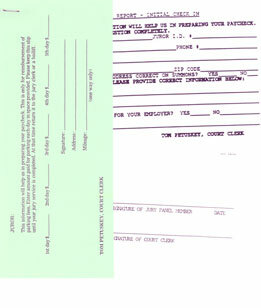 And since then, he has sent in another copy to Court Clerk Tom Petuskey's office. And later he was called to jury duty on the juvenile level. The map was confusing as well. You can guess what he did for them. "That sounds like something he'd do," his secretary said. Watson has not even received a thank you from Petuskey's office. We called and the court administrator knew nothing of using a 'new' brochure. I made an appointment to present the revised pamphlet to the Oklahoma County Clerk. The presentation went well, the clerk was impressed and admitted it was a huge improvement. He liked how it respected and educated the citizen in a clearer and friendlier way. 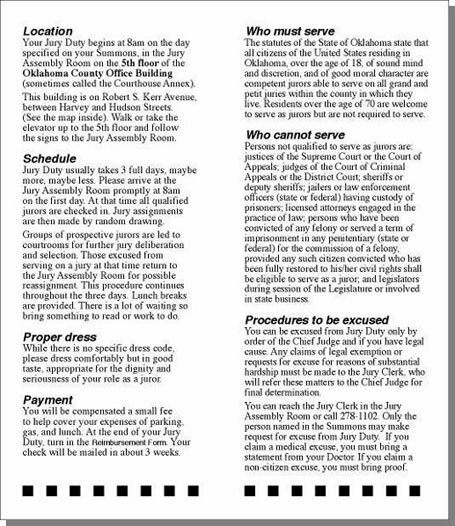 I made a couple of follow-up calls and even got some very favorable press coverage in The Edmond Sun, but, as of yet, the County Clerk has not implemented the new pamphlet nor made any improvements to the summons and letter. • Forms to turn in are bundled together with instructions to detach. 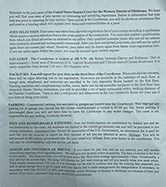 • There is a new Info sheet (the blue page above) with more specifics on location, facilities at the courthouse, parking, time schedule, proper dress, and how to be excused. • There is a friendlier, more respectful tone in the writing. The improvements clearly seem to be influenced by the brochure I submitted many years ago. 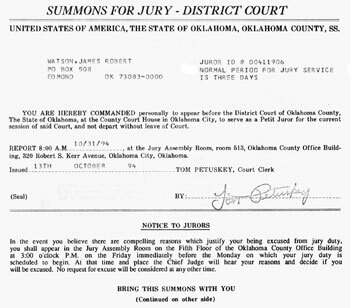 Some people assigned to jury duty are asked to serve on a juvenile case which meets at a different location. 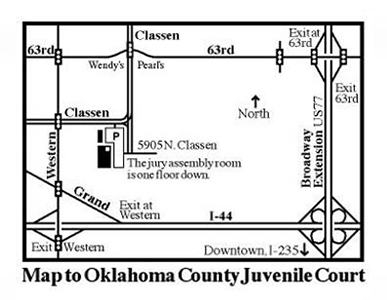 Those asked are given a map (see below) to help them get to the Juvenile Courthouse. 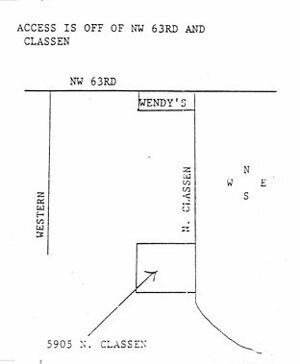 Once, while summoned to serve on jury duty, I was assigned to such a case and got the map. I was somewhat appalled at the poor design of the map so, of course, I had to redo it (below). The existing map looked cheap, sloppy, and unprofessional. The original was probably designed by someone who already knew how to get to the Juvenile Court, so it doesn't do a good job of clearly communicating to the novice - and almost everyone who gets the map is a novice on where the Juvenile Court is located. They put in a few landmarks so the person could get some bearing. 1. The streets and intersections are more clearly delineated. 2. There is more landmark identifying information. 3. At the Juvenile Court, access to parking is clearly conveyed. 4. It includes more freeway references with exits denoted. The new version was designed for someone who doesn't know how to get to the court. Great design must be for the user, not for the client, and certainly not for the designer. 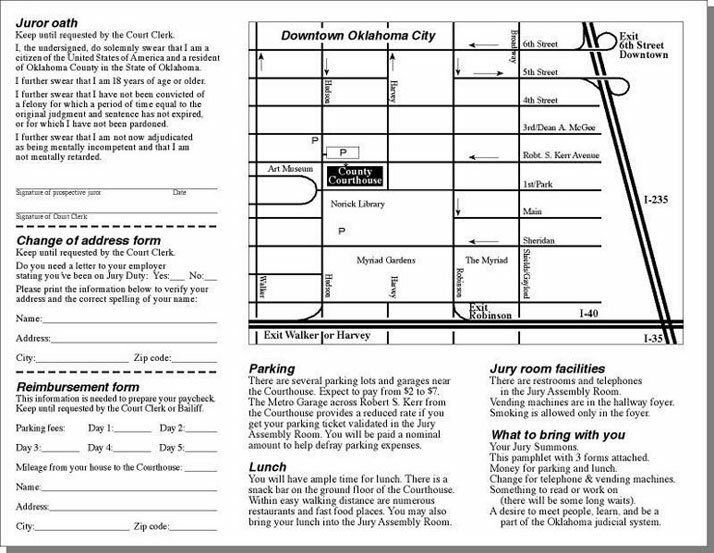 I revised the map and mailed it to the Oklahoma County Clerk with an accompanying letter explaining the advantages of the new map. I gave permission for the county to adopt, copy, and distribute the new map free of charge. I've yet to get a response from the County Clerk. That was just in 1998, so there's still hope.